Minerals Separation, London (acquired directly from the artist in September 1966). Anon. sale, Sotheby's, New York, 23 March 1983, lot 59. Waddington & Bernstein, Zurich (acquired at the above sale). Acquired from the above by the present owner in March 1983. A. Bowness, ed., Henry Moore Sculpture and Drawings, London, 1965, vol. 3 (Sculpture 1955-64), p. 30, no. 480 (another cast illustrated, pls. 116-119). H. Read, Henry Moore: A Study of his Life and Work, London, 1965, no. 221 (another cast illustrated, p. 234). I. Jianou, Henry Moore, Paris, 1968, no. 458 (another cast illustrated, pl. 17). R. Melville, Henry Moore Sculpture and Drawings 1921-69, London, 1970, p. 363, no. 619 (another cast illustrated). G.C. 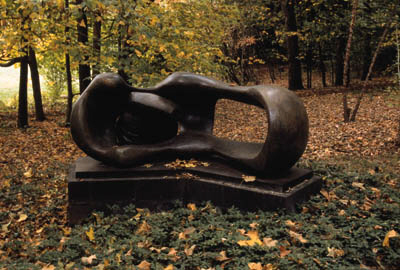 Argan, Henry Moore, New York, 1971, pls. 163-164 (illustrated). J.I. del Marquet, Henry Moore y el Inquitante Infinito, Barcelona, 1979, no. 52 (another cast illustrated). F. Russoli and D. Mitchinson, Henry Moore Sculpture, London, 1981, p. 158, nos. 338-340 (another cast illustrated).